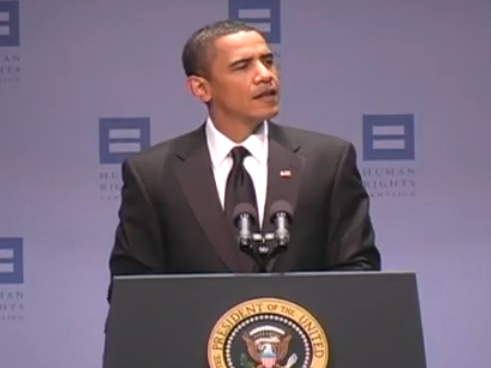 President Obama addresses the 2009 HRC Annual Dinner. Video still courtesy HRC. Morning anchor Xorje Olivares will report live from the Washington Convention Center for immediate reactions to the president’s speech and will be live-tweeting during the event. Meanwhile, OutQ News Director Tim Curran will be at SiriusXM’s headquarters in New York talking to progressive LGBT bloggers Pam Spaulding of Pam’s House Blend and Joe Jervis of JoeMyGod. Together they will offer an analysis of the president’s remarks, with an opportunity for you to call in and share your thoughts on his address as well. Gay rights advocates are hoping President Obama will finally come out in full support of marriage equality–he has only said that his views are still ‘evolving.’ They would also like him to mention the Employment Non-Discrimination Act, or ENDA. It’s almost certain that the president will address the repeal of the ‘Don’t Ask, Don’t Tell’ policy, which became official on September 20th. He may also make note of the recent suicide death of 14-year-old Jamey Rodemeyer, especially after pop icon Lady Gaga brought the issue of anti-gay bullying to his attention during a fundraising event last weekend. OutQ News Reports: ‘The President’s Equality Address’ will begin at 7pm ET, shortly before the president is scheduled to speak. We invite you to participate in the conversation by calling us at 866-305-6887 or replying to us at @outqnews and @outq. Congressional leaders have introduced federal legislation that would prohibit anti-LGBT discrimination in housing. HBO is marking the end of the ‘Don’t Ask, Don’t Tell’ policy by airing a new documentary that chronicles the ban on openly-gay military service. Even though the law banning openly-gay military service will OFFICIALLY be lifted Tuesday, LGBT rights advocates are reminding TRANSGENDER troops that ‘Don’t Ask, Don’t Tell’ repeal does NOT apply to them.